So I am mostly adding this because ideally I’d like this project to have as many types of music for different cultures as possible, because gaming isn’t limited to medieval Europe as we all know, so setting music can be really helpful to give different campaigns different feels. It’s not ideal for gaming exactly, and I’ve never used it, but I’d like to add some variety, and I don’t have much to offer in some areas right now. 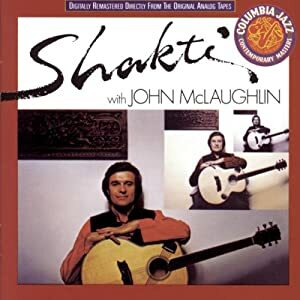 John McLaughlin is a jazz guitarist who played with Miles Davis during his jazz fusion years. He is amazing. He plays an acoustic set with a few other amazing musicians who play traditional Indian instruments, such as tabla, ghatam, and mridangam. There is also an amazing violin player. The style of music is fusion of jazz and “world” (the generic American term for anything traditional to a region or culture). Of the three tracks on the album the first and third are both very long (18 min and 29 minutes) and full of high speed action. The second track “Lotus Feet” is almost 5 minutes long and is much slower in pace.